yes Mali0014 you need to score at least 70% in order to pass. It is 150 multiple choice questions and you have 5 hrs and 40 minutes. I found the practice tests that I purchased to be a big help. Going to take the CPC exam in 3 weeks. 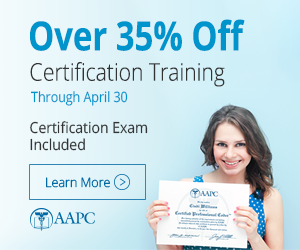 I was wondering if anyone has tried the webinar the AAPC has "how to pass the CPC on your first try"?? I saw it in this forum but have never heard of it. Did anyone try the webinar? I took the exam for the first time Saturday and to my shock passed. I was sure I failed. But, I can tell you for a fact that there is no way I could have passed this grueling exam with out serious prayer. I asked the Lord to go with me into the test and keep my thoughts and focus clear. At about 4 hrs in I started to panic, I said a silent prayer and the Lord calmed me right down. Anyway, study hard and DO NOT change your answers. Your first answer is usually the right answer. I cannot find this webinar on AAPC..Please help! how do I check my test result?? Hi I have booked my exam date on November 8th 5days back and this is my second attempt, till now I didn't receive my Hall ticket. Please advise whether it will take time or need to do anything. For my 1st attempt I received within 2days, so I'm little confused. CPB of CPC -P ?